Don’t let your heart kill you!! Because I live in Indiana, this research was geared towards fellow Hoosiers – however there are lessons here for all Americans, coast to coast … not just those of us who’ve settled in a fly-over state. 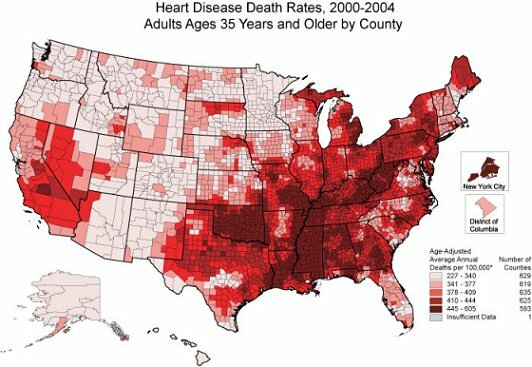 In a recent study by the Center for Disease Control on heart health, Indiana and Missouri tied for 37th place – not the best marks considering 35 states fared better. But there are a number of things we can do to help improve our score and our lives. (Want to know how your state ranked? Check the links below) …The AHA has developed a set of guidelines called Life’s Simple 7™ designed to lead individuals down a heart-healthy path and stop heart disease before it’s given a chance to start. 1. Get Active: Close to a third of Indiana’s population does not get adequate exercise. If you get at least 30 minutes of moderate physical activity each day (like brisk walking), five times per week, you can almost guarantee yourself a healthier and more satisfying life while lowering your risks for heart disease, stroke and diabetes. 2. Control Cholesterol: When you control your cholesterol, you are giving your arteries their best chance to remain clear of blockages. 3. Eat Better: 80% of Indiana residents do not eat the recommended 5 or more servings of fruits and vegetables each day and poor eating habits mean more of us have risk factors for heart disease, stroke, diabetes and obesity. 4. Manage Blood Pressure: High blood pressure is the single most significant risk factor for heart disease. When your blood pressure stays within healthy ranges, you reduce the strain on your heart, arteries, and kidneys which keeps you healthier longer. 5. Lose Weight: 29.2% of Hoosiers are obese – but we’re not alone. More than 2/3 of the American adult population is overweight, with 1/3 of us in the obese category. If you’re overweight or obese, you can reduce your risk for heart disease by successfully losing weight and keeping it off. Even losing as few as five or ten pounds can produce a dramatic blood pressure reduction. 6.Reduce Blood Sugar: Lowered blood sugar helps protect your vital organs. When you reduce excessive sugars, you are giving yourself the best chance for a healthy life. 7.Stop Smoking: Nearly one quarter of adults in Indiana smoke and cigarette smokers have a higher risk of developing cardiovascular disease. If you smoke, quitting is the best thing you can do for your health. My Life Check® was designed by the American Heart Association with the goal of improved health by educating the public on how best to live. These measures have one unique thing in common: any person can make these changes, the steps are not expensive to take and even modest improvements to your health will make a big difference. Start with one or two. This simple, seven step list has been developed to deliver on the hope we all have–to live a long, productive healthy life. NOTE: This is research I did while writing an article for The Indianapolis Star and the American Heart Association. Go HERE to view the entire publication. Previous Ever See a Yogi Run Fast? Next What’s hidden on da Vinci’s computer?